When most people start getting excited for Summer, they have visions of Refreshing Blue Swimming Pools, Family Vacations, and Cherry Flavored Popsicles. 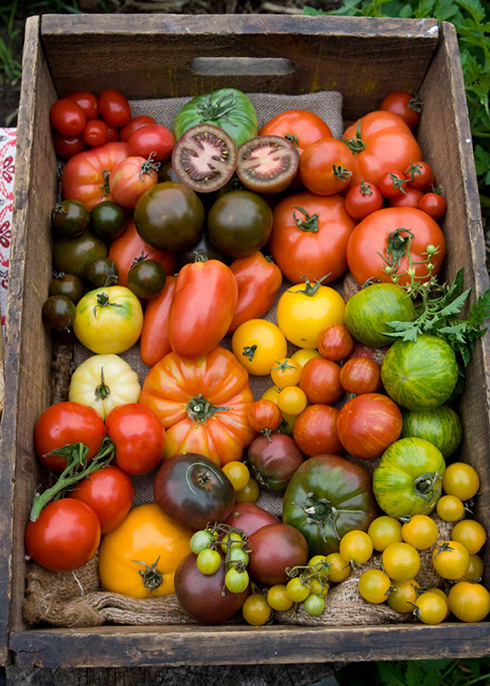 I literally count the days until the warm weather arrives, and I can finally have Heirloom Tomatoes. To me, Summer Time equals Tomatoes. Plain and simple. 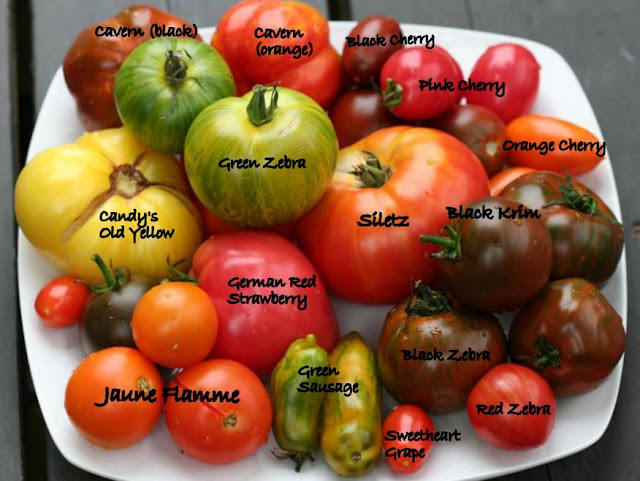 What is an Heirloom Tomato you might ask? Basically it's a tomato that's been passed down through several generations because of it's valued characteristics. 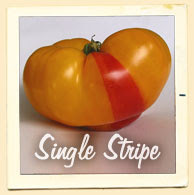 A tomato variety that has been in circulation for 50 years. Seeds that have been passed down from generation to generation. Basically they are hand-me down seeds, from years and years and years of being perfected. Then, it gets all Sciency and they cross these Heirloom Tomato Parent Plants...well you know, then they make all these wonderful OLD tomatoes that have been perfected over the years. 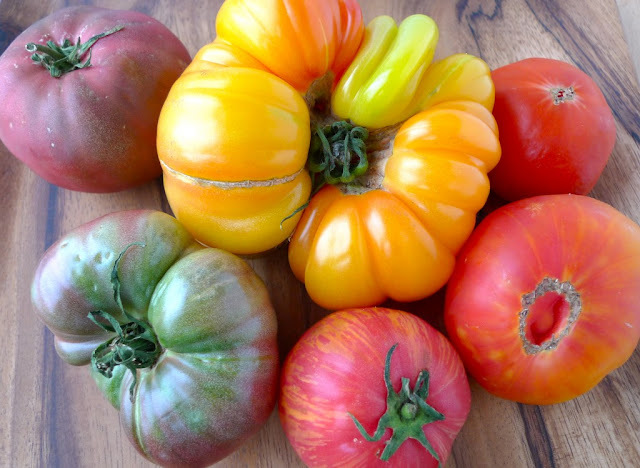 Heirloom tomatoes must be bought locally cause these little darlings are too delicate to ship, so the best place to buy them are at your local Farmers Market or Whole Foods, or maybe a local family owned grocery store. Most of the big chain grocery stores don't carry them. Cause you know, they buy their tomatoes from far far far away and have them shipped long long distances and they ripen in the semi truck on the way to the grocery store. Yuck. Every Heirloom tomato is genetically unique. They are so beautiful. So many colors and fun patterns. Oh and FLAVORS! There are literally over a Hundred varieties of these perfect plants. NOTHING is more perfect. One Delicious way to serve these angels, and to really bring out their taste to the fullest, is to roast them. This is my all-time favorite way to eat an Heirloom Tomato. Turn your oven onto Broil. If you have an oven that says Hi Broil or Lo Broil, put it on Lo. But if you don't, that's ok too. Ohhh and make sure your baking rack is set to the medium level. We don't want it up really close to the broiler element. That would NOT be good. For this recipe, I selected a nice round Heirloom that will make two thick slices. If you get a really large Heirloom, which there are many, you might be able to get three nice thick slices out of it. Cut them into beef-steak type slices. I take the left-over ends and pieces from the Heirloom and just dice them into nice chunks and put them in a baggie for later. I add them to my scrambled eggs, or throw them on top of my salad. Don't let this delicacy go to waste. Place your slices on a greased cookie sheet. Drizzle the top with Olive Oil. Be generous. Now, sprinkle top with Kosher Salt. Now sprinkle the top with freshly grated Parmesan cheese. On top of the Parmesan, place a slice of fresh Mozzarella. I like to buy these Fresh Mozzarella in these little medallions. This size is perfect for topping things with. Now you can put one of these Medallion on top, or two. Whatever floats your summer-time raft. But I like to put two on top. Just because it's that kind of day today. Now pop your baking sheet into the oven. Remember to have your rack set to the middle level. We don't want to have these delicate things too close to the broiler element. Keep an eye on them. Make sure your oven light is on and keep checking them. It should take about 6 minutes or so. Depending on if you have a Hi or Lo broil on your oven. You basically are wanting to be sure the cheese is all melty and has a couple brown bubbles on top. When they're done, you will be able to tell. Because your heart will start pounding really fast......and your mouth will be watering like the drinking fountain at your child's playground at the local park. Words can't express my happiness at this exact moment. Well, all you summer fans.............go ahead, run along to the swimming pool. Wow - that looks a-m-a-z-i-n-g! I'm a HUGE tomato fan and I adore fresh mozzarella! Beautiful blog! Oh my goodness! My mouth is watering! I can't wait to get my garden growing. BTW, if you are buying an heirloom from a market to save the seeds, there is a special way to save them. You will need to google "how to save tomato seeds" to learn the method.